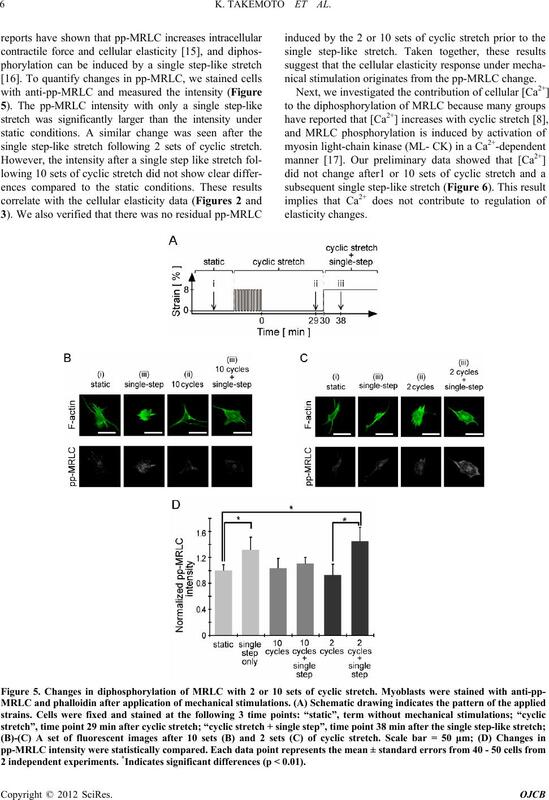 cyclic and step-like stretches are mediated by MRLC. 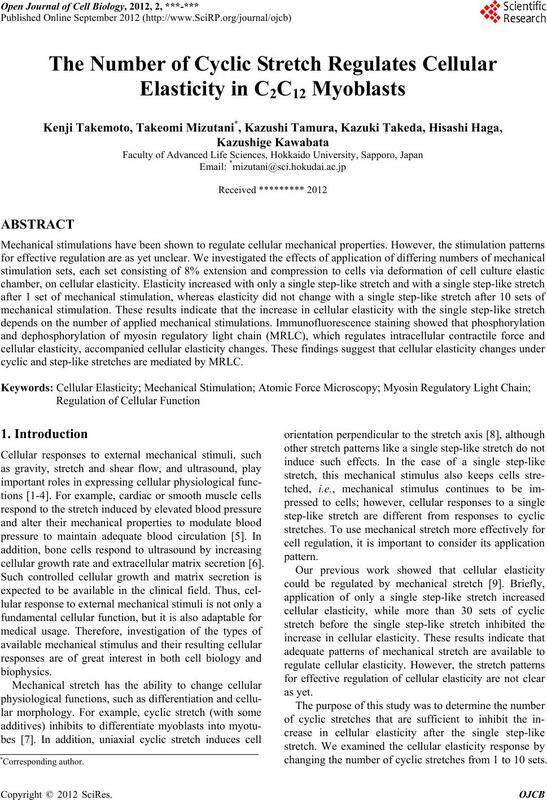 cellular growth rate and extracellular matrix secretion . changing the number of cyclic stretches from 1 to 10 sets. humidified atmosphere of 5% CO2. Figure 1. Experimental setup for stretching C2C12 myoblasts. formable elastic cell culture chamber to which cells adhered. and a wall of 20 mm height by transparent silicon rubber. elasticity image (D) for the evaluation of cellular elasticity. Position of the area was determined by the above procedure. that the targeted 15 m area is roughly on celular nucleus. elasticity was measured by the force mapping method. were taken typically at 5.0 Hz with a z range of 1500 nm. were fit to the above model. the reduction of target pixel points to 16 pixels × 16 lines. Fluo-8 AM esters in DMSO) and stored them at –20°C. stretch (indicated as an arrowhead) increased significantly compared to before the single step-like stretch (indicated as an arrow). applied prior to the single step-like stretch. 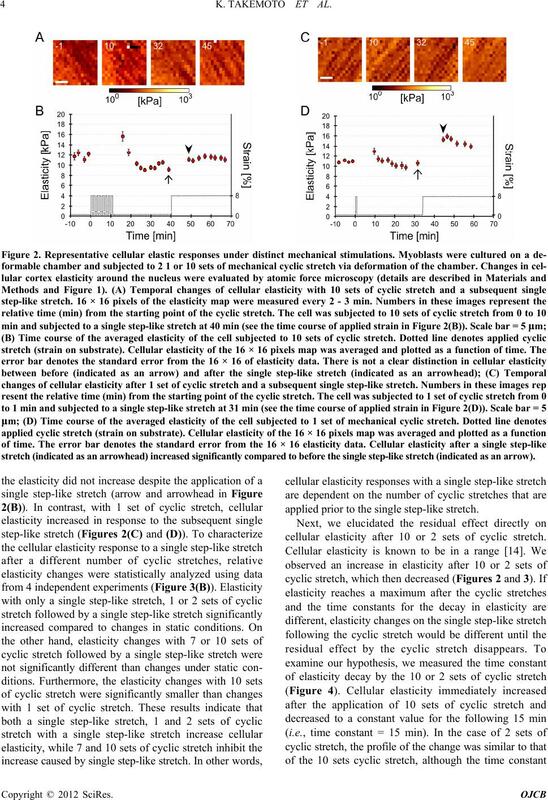 cellular elasticity after 10 or 2 sets of cyclic stretch. nificant differences from the “static” state (p < 0.01). the single step-like stretch (Figures 2(B) and (D)). indicated as dashed lines in Figures 4(B) and (C)). which are thought to contribute to cellular elasticity . single step-like stretch following 2 sets of cyclic stretch. 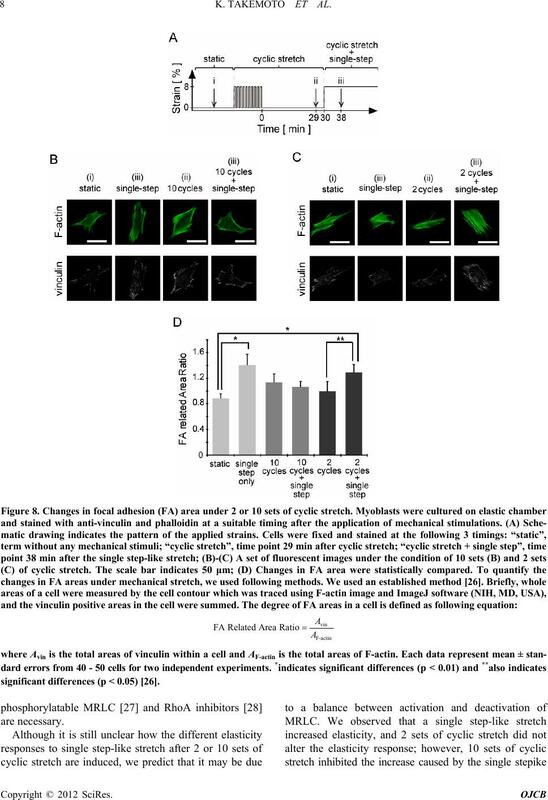 nical stimulation originates from the pp-MRLC change. 2 independent experiments. *Indicates significant differences (p < 0.01). 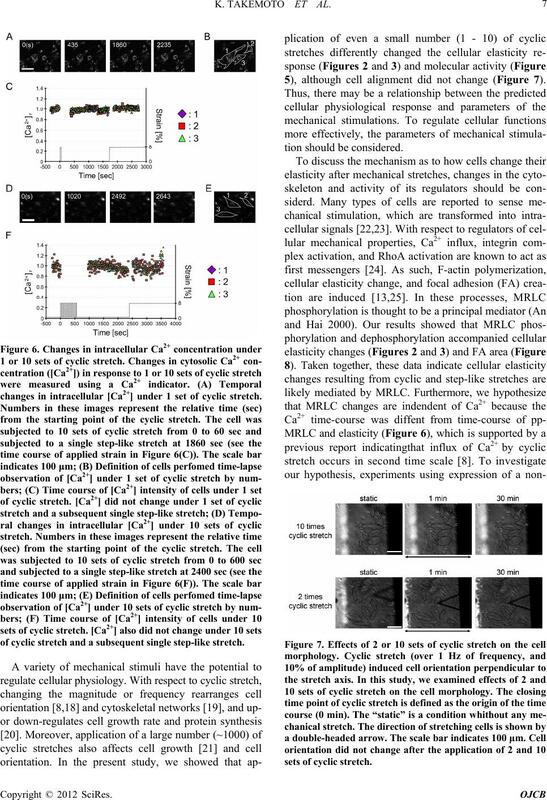 changes in intracellular [Ca2+] under 1 set of cyclic stretch. of cyclic stretch and a subsequent single step-like stretch. 5), although cell alignment did not change (Figure 7). significant differences (p < 0.05) . B-Reviews, Vol. 16, No. 5, 2010, pp. 467-491. Vol. 89, No. 4, 2010, pp. 331-343. 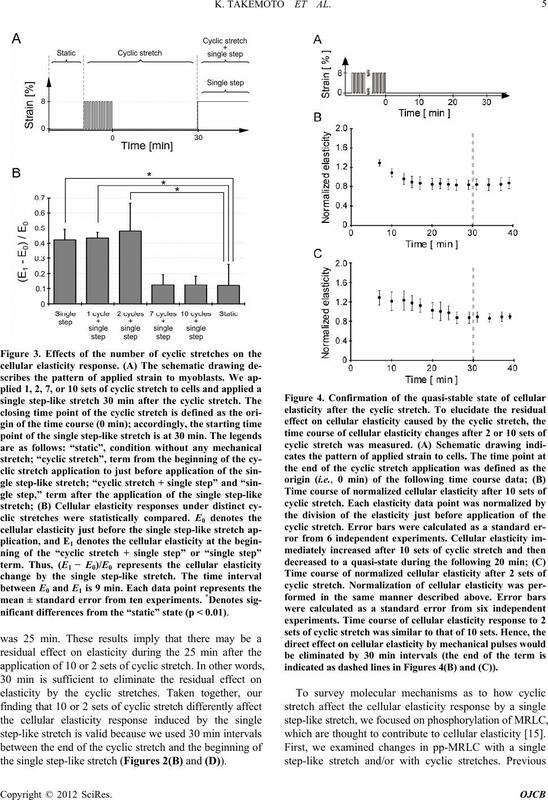 Mechanobiology, Vol. 9, No. 6, 2010, pp. 659-670.
apy, Vol. 10, No. 5, 2010, pp. 689-700. Vitro,” Ultrasound in Medicine and Biology, Vol. 27, No. 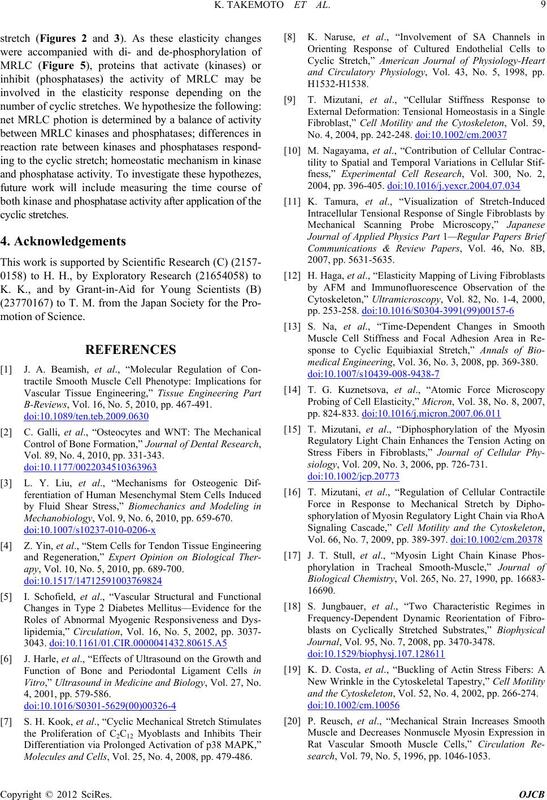 Molecules and Cells, Vol. 25, No. 4, 2008, pp. 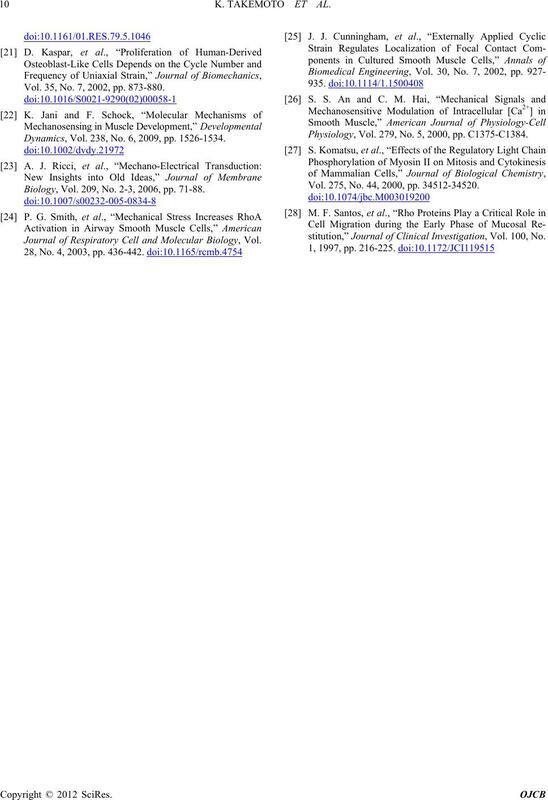 479-486.
and Circulatory Physiology, Vol. 43, No. 5, 1998, pp. medical Engineering, Vol. 36, No. 3, 2008, pp. 369-380.
siology, Vol. 209, No. 3, 2006, pp. 726-731. Journal, Vol. 95, No. 7, 2008, pp. 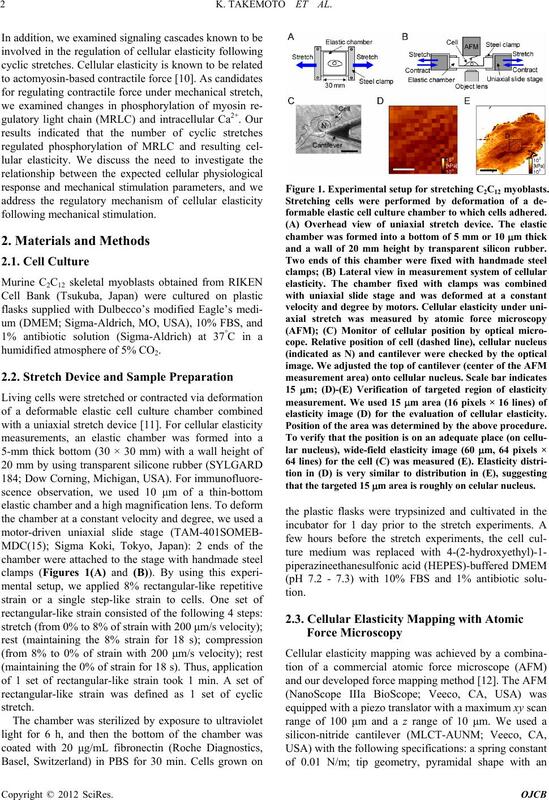 3470-3478.
and the Cytoskeleton, Vol. 52, No. 4, 2002, pp. 266-274.
search, Vol. 79, No. 5, 1996, pp. 1046-1053. Vol. 35, No. 7, 2002, pp. 873-880. Dynamics, Vol. 238, No. 6, 2009, pp. 1526-1534. Biology, Vol. 209, No. 2-3, 2006, pp. 71-88. 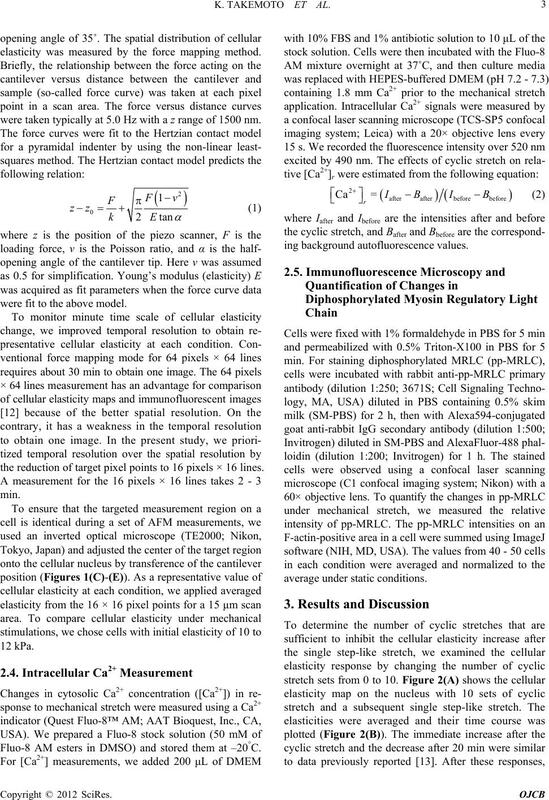 Journal of Respiratory Cell and Molecular Biology, Vol. Physiology, Vol. 279, No. 5, 2000, pp. C1375-C1384. Vol. 275, No. 44, 2000, pp. 34512-34520.
stitution,” Journal of Clinical Investigation, Vol. 100, No.